Let’s face it…the music business has changed enormously in the past 20 years. The advent of modern recording technology has brought with it a new DIY culture, where young artists have everything they need right at their fingertips to record great sounding albums in the comfort of their own homes. Every young artist or engineer can easily get their hands on the hot new plugin of the week and, with a little knowledge, a great ear and some ingenuity, quickly create tracks that sound every bit as good as the top streaming songs in the world. It’s an amazing time to be in music. But with an entire generation of young artists trying their best to sound like what’s already on the radio and streaming charts, it has become incredibly easy to get lost in the sea of homogeneity, where every song sounds like it was made with the same software. So how do you create new music that stands out from the crowd? Well, to change the future, you sometimes have to look to the past. And that’s why XILS decided to release digital emulations of some the most unique, timeless and groundbreaking synthesizers in music history, such as the VCS3, Polymoog and EMS Vocoder, that helped pioneering artists like The Who, Pink Floyd, Led Zeppelin, Kraftwork, ELO, Brian Eno, Peter Gabriel, Gary Numan and others change the sound of popular music. Only now, those same legendary synths have been upgraded with a ton of new features, making them more powerful and versatile than ever before. Certain things have become “timeless” for a reason. 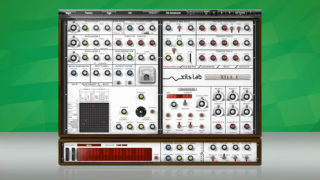 And with this new incredible synth bundle, XILS is offering you the genius of yesterday, to help you create the classics of tomorrow. Welcome to the XILS Pleasure Bundle, a carefully selected collection of faithfully reproduced digital emulations of some of the most legendary and recognizable synthesizers in music history. Updated with hundreds of new features only recently made possible by today’s digital technology. Set your self apart by incorporating the sounds of some of the most pivotal and influential synthesizers ever created, and let the icons of the past help you shape the sounds of the future. XILS has reimagined the legendary tools of the past, so you can build the sound of future. Why The XILS-Lab Pleasure Bundle Is Such a Big Deal? The XILS Pleasure Bundle gives you spot-on digital emulations of the most influential and character-filled synthesizers in music history. Sign up now and get the XILS-Lab Pleasure Bundle for one LOW monthly rate! "My 2 favourite analog synths are probably the VCS3 and the Synthex. So when I heard that a company was releasing a software version, I was quite cautious.. Today the XILS 4 is one of my favourite plugin..!! I find the same excitement working with it, than with the original, plus lots of other features.. 2 Vcs3 interconnected sequencer.. Etc the sound is great and it is one of the best in the market for experimenting new ways of creating sounds ..!! I just got the miniSyn'X and I am so excited as well because the Synthex is a fantastic rarity. Thank you to XILS LAB to give every one the possibility to play with them..!" " Over the years I've been extremely fortunate to have worked on synthi A's and other legendary hardware modulars, but it wasn't until i fell in love with the XILS 4 that i became a fanatic about a soft synth. This is a life changing tool that you will instantly go to over and over again ...i simply can not give the XILS 4 a higher recommendation ...its absolutely 100 percent indispensable modular heaven." "PolyKB? YEAH!! Man, talk about a synth with LOADS of potential! EXCELLENT WORK! The XILS 3 is juicy as well..."
XILS Lab is a developer of some of the most versatile and innovative audio software on the market today. Under the stewardship of founder Xavier Oudin, XILS Lab’s “Expertise Network”, comprised of some of the industry’s top musicians, engineers and software developers, aims to take today’s digital recording technology in exciting new directions. HOW DOES THE XILS BUNDLE WORK? Choose a Monthly plan for only $25.00. Once your subscription starts, you’ll have instant access to the entire XILS-Lab Pleasure Bundle. Sign up now, and as long as your subscription remains active, your monthly rate will never go up, and you will get every XILS-Lab Pleasure Bundle update as soon as they are released. That’s one price, and limitless XILS-Lab Pleasure Bundle plugin updates! You can get EIGHT world-class synth plug-ins PLUS every NEW plugin update with the XILS-Lab Pleasure Bundle from only $25.00 a month. And there’s absolutely no risk to subscribe. If you’re not completely convinced that the XILS-Lab Pleasure Bundle will help you create original, great sounding mixes, you can cancel at any time - ZERO obligation.